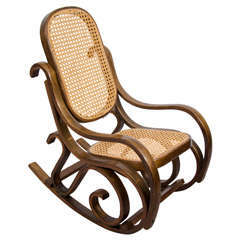 Child's chair designed by the artist Piet Hein Stulemeijer. Distinctive Dutch design from 1968. Similar chair in the permanent collection of Museum Boijmans van Beuningen in Rotterdam, The Netherlands Publications/Literature: - The furniture collection Stedelijk Museum Amsterdam, NAi publishers Rotterdam, p 360 - Kid Size - The material world of childhood - Vitra Design Museum p 258 wipper en 299 chair. Very good vintage condition. We would like to point out that all vintage items have minor imperfections such as little scratches. Mayor imperfections are always shown on pictures or mentioned. Rocking car designed by Hans Brockhage, produced by Siegfried Lenz. Purchased from the first owner. 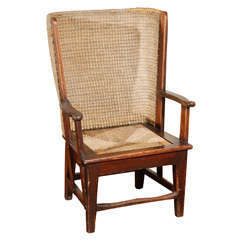 Mid-19th century American antique oak children's Fireplace chair with woven rush seat. 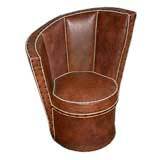 This chair was most probably a salesman's sample or a custom version of this wingback gem. 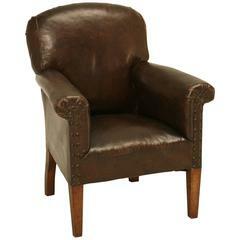 A charming child-size chair executed in a very grown-up assymetrical "glam" style. Genuine vintage example, rarely seen. Note: seat height is 12". 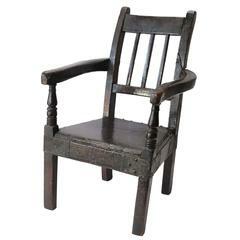 19th century painted child's chair with repairs made in metal. Detail turning of the arms. Charming example of English country Folk Art.